…two films that I would normally not watch, yet I feel compelled to write about them. Over the Thanksgiving holiday, when one is stuck inside a small Mid-west home with relatives, and with not much to do, sometimes a film on television is a nice distraction (if one’s mother-in-law will stop talking long enough for the dialogue to be heard). That is how I came to watch “Mr. 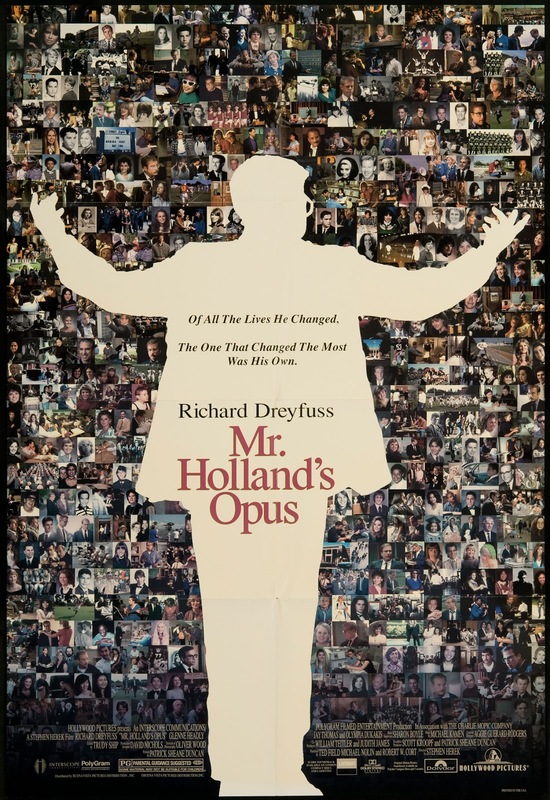 Holland’s Opus” with Richard Dreyfuss. As I said, this is not a film that I would normally be attracted to. It was released in 1995 and I had managed to avoid it all these years, but alas, it was on, and there I was. And I must say that I was a little surprised. It seemed like something one would roll one’s eyes at on the Hallmark Channel, and although there is a definite “Hallmark Channel”-ness to it all, it does have some sweet moments. For those, like me, who have never seen it, we follow Glenn Holland (Richard Dreyfuss), musician/ teacher/ composer through the ups and downs of his life. His first day of teaching music in high school does not go well, but he develops a passion for it and for bringing music to the lives of his kids. He and his wife have a son who, to the dismay of Glenn, turns out to be deaf. Deprived of sharing his passion for music with his son, Glenn keeps their relationship at arm’s length. Yes, I know, this all sounds VERY “Hallmark”-y, but as the years passed, and as the characters grew (up or old, depending), I ended up being drawn in. Mixed in with a predictable story line are some poignant and genuine events and emotions. The way children can be inspired by teachers, and the special bond that can develop between a student and a mentor is lovingly depicted in this film. Mostly, I found “Mr. 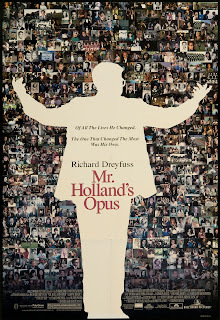 Holland’s Opus” to be an inspirational ode to teachers, those people who are not paid enough to tackle a job that very few feel called to pursue. And I thought of a few people and very special teachers in my own life who may have started out as teachers but ended up as dear friends, to this very day. Being shown immense possibilities and a world of culture by these most special people helped make me who I am today. As I watched his students’ tribute to Mr. Holland, I thought of my very own Mr. Hollands: thank you forever to Odette, Anne, Betty, and Harvey… I love you all. Recommend? Yes, I think so. Based on a concept by Ahmet Zappa and starring Jennifer Garner, Joel Edgerton, and CJ Adams, this film is another film that seems like it would be right at home on the Hallmark Channel (it was made by Disney after all), but unlike “Mr. 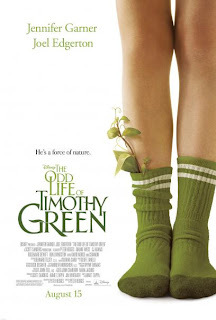 Holland’s Opus” which deals with real life situations and disappointments, “Timothy Green” is an absolute fable, a fairy tale, perhaps even an updated version of a folk tale. When Cindy and Jim Green (Garner and Edgerton) find out they cannot have children of their own, they try to come to terms with the emotionally devastating news by conducting a very personal ritual, the kind that seems like it would come from Jungian psychology: after heartache and some wine, they imagine the son they will never have and memorialize his qualities and life events with pencil on slips of notebook paper which they gather and put into a small wooden box. That night, they bury the box in the garden behind their house, but a suspicious freak storm arises, and after the ground has been watered, a charming and muddy ten-year old boy shows up in their home (played with stunning maturity and beautiful sensitivity by CJ Adams), referring to Jim and Cindy as mom and dad. They actually put two and two together, unlike so many dense film characters, and understand that this is the magical manifestation of their imaginary child. The story from here on is perhaps a tad predictable, but the tone of the film is gentle, unhurried, and slightly surreal. This is because the film also possesses a kind of metaphysical charm, since it aligns itself with the aforementioned fairy tale template. Think of Gepetto carving a son out of wood, and wanting with all his heart for Pinocchio to be real. Think of Greek myths where Baucis and Philemon turn into an oak and linden tree respectively, or Daphne turns into a laurel tree. Think of fairy tales where plants have magical properties like a beanstalk that grows to the clouds. This type of symbiotic and mystical relationship between man and plant has been around for centuries. Witness the Wiccan Green Man which shows up in many other unrelated cultures. So, of course since Timothy is from the natural world, he possesses a certain innocence coupled with a supreme self-realized, calm, and innate knowledge which touches the lives of all those around him. I can forgive the film for being a bit sappy and sentimental since it is clearly presented in a way that does not mistake itself for reality. It turns out to be lyrical, fantastical, and quite touching. Perhaps it touched me so because, as regular readers can tell from recent posts, I just observed the anniversaries of the deaths of both of my parents, who died well before their time, and before they would have wanted to leave. The absolute, unconditional love for their magical son exhibited by both Jim and Cindy Green reminds me so much of the rare, unique unconditional love I felt from my mom and dad. Perhaps it is because I still miss them so much that I found this film to be so tender and vital. It might be a modern fairy tale, but the yearning to nurture, to love, and to connect is genuine and universal. And like so many folk and fairy tales, “The Odd Life of Timothy Green” has a very bittersweet ending. From love and loss comes growth. Something must die for something else to be born. Recommend? Yes. It has a lovely heart and is certainly worth a view.